Dishwashers need good servicing in order to operate without making your life difficult. So, if you’ve got problems now or want to service the appliance to prevent trouble, you can always turn to our dishwasher technician in Markham. Qualified to service most brands and trained to deal with problems, our pros can help you to your satisfaction. 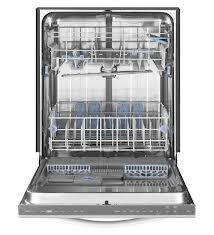 We are the ideal team for all dishwasher related services because we can do everything for you. From new installations and repairs to the maintenance of the dishwasher, Appliance Repair Markham is at your disposal. Overflowing dishwasher? The cycle won’t stop? Call us now for dishwasher repair in Markham, Ontario. There are many dishwasher models out there and there are differences between brands, but the philosophy of these appliances is one. They should wash your dishes. The techs on our team understand that the special features of each appliance can make a difference. So we keep getting updated with any new appliance and are factory trained to repair them all. What’s the problem with your appliance? Your glassware keeps coming out dirty? With dishwasher troubleshooting skills, our tech will check the appliance and pinpoint its problematic parts. Since we come fully equipped for the job, we can replace all worn parts at once. Want under the sink dishwasher installation? Thinking of getting a built-in kitchen appliance? When you need expert installers, ask our help. Our pros have the skills to install the most advanced models. No matter which dishwasher you get, depend on our techs to check its specs and do the job correctly. Get in touch with our dishwasher technician if you prefer to be spared of the hassle of urgent problems. With maintenance, that’s possible. Thorough and knowledgeable, our techs can tune up the dishwasher and do any replacements and repairs are required to keep it running and prolong its lifespan. When you count on our Markham dishwasher technician, your needs are served correctly and promptly. Give us a call today regardless of your needs.